During the gold rush being out in nature away from even the small Wild West style towns, shaving was not always an option. The miners are often called 49'ers referring to the biggest year of the California Gold Rush, 1849. 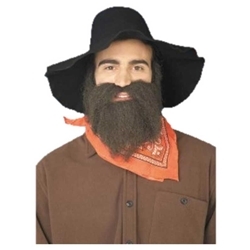 This beard and moustache set gives you the look of being out in the mines panning for gold for days on end.